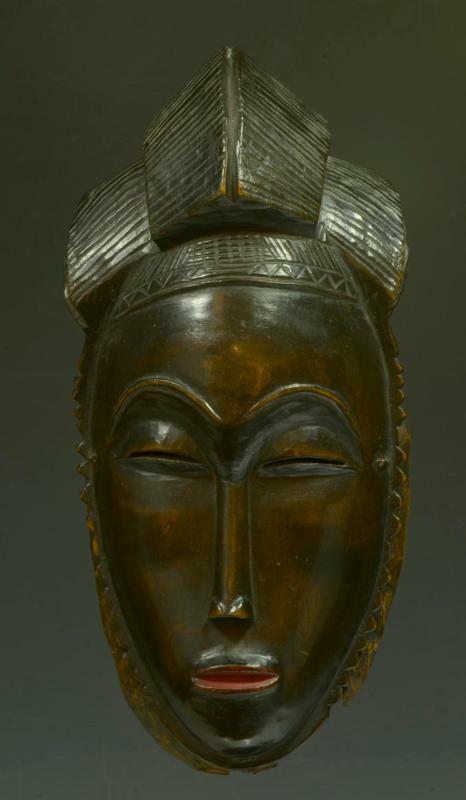 A fine and expressive wood face mask with thin arched brows, pierced slit eyes, slender elegant nose, small grooved mouth with red coloring, notched triangular design down the sides, and a tripartite striated coiffure on top. Small metal attachments present on temples. Provenance: Ex. French collection. Ex. Guilhem Montagut. Age use and minor losses/chips. Size: 10-1/2 inches + custom mount. A very refined and classic example.